Posted 19th June 2013 by Myfanwy in Advice, Problems with buses. Bus drivers deal with two well-known stress inducers: traffic, and the general public – often both at the same time. No wonder, then, that they are not always twinkly-eyed paragons of civility. All the same, there is no excuse for really bad behaviour – we believe that every passenger has the right to travel without verbal abuse. FixMyTransport processes a large number of complaints about bus drivers’ manners. While some concern pretty mild outbursts, others see passengers at the receiving end of the sort of language or behaviour we wouldn’t use on our worst enemy. 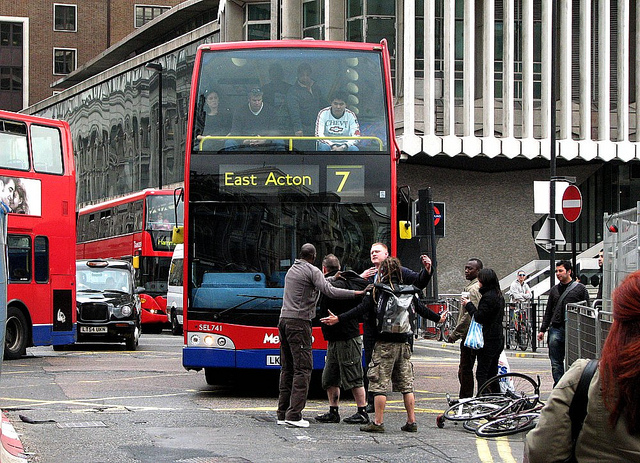 What should you do if you find yourself at the receiving end of a bus driver’s incivility? Here’s our advice. Do not get drawn into an argument. The chances are that the driver is already stressed. Walk away, and let him or her concentrate on driving the bus. 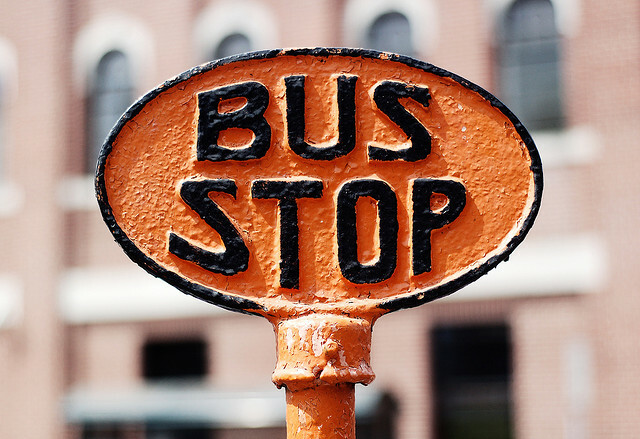 Make a note – mental or written – of the bus’ route number, the driver’s appearance, and the exact time and place of the incident. In most cases this will be enough information for the operator to identify the driver, but you may also wish to note the bus’ numberplate or the driver’s badge number (which he or she is obliged to tell you if asked – although you may not wish to exacerbate the situation by asking). Almost all buses have CCTV fitted, so it’s not normally necessary to obtain witnesses’ contact details. The operators will use the CCTV footage to check what happened – and you have the right to view it too, in most cases. However, the video tape is quickly erased and re-used (within 7-10 days, says TFL), so be sure to lodge your complaint as soon as possible after the incident. Use FixMyTransport to make your complaint. We’ll publish it online as well as sending it to the operator, which means that other passengers are given the chance to comment or offer support – and to chime in if they have experienced a similar problem on the same route. Include all the details you gathered at the time, unless this includes the driver’s name, which we’d advise you to disclose only when in one-to-one correspondence with the bus operator. Normally, the operator will apologise on behalf of the driver and to assure you that he or she has been spoken to or disciplined about the incident. Note that it often takes quite a long time before you receive a response to this sort of complaint – that is because the operator will be investigating the incident and going through a formal disciplining procedure. In the case of TfL, it may take even longer while they send your report on to one of the many bus operators that run their routes under franchise. Because of the staff’s right to privacy, the outcome of such procedures is generally not shared. In all but the most severe cases, it is unlikely that you will be compensated substantially. You may receive a couple of free tickets by way of an apology. But if all goes well, you do get the satisfaction that such an incident is less likely to happen again. What if the incident was really serious? Your first action should always be to contact the operator. But if you feel that an apology is not enough, you might subsequently consider taking your complaint to one of the transport watchdogs who will advise on next steps. Posted 2nd May 2013 by Myfanwy in Advice, Discontinued routes, Problems with buses. As austerity measures start to take effect, many bus routes across the country are being reduced, or withdrawn altogether. One bus journey may feel just the same as another to you, the passenger – but there is a crucial distinction at play. The vehicles are the same, the fares and even the drivers are the same – but often, services that would not make a profit for the operator are subsidised by the council. These include early morning and late night runs, and routes taking in remote or rural locations, where passenger numbers don’t offset the cost of the journey. It is these services that are most at risk as the government puts pressure on local councils to spend less. Slashing these routes might help the councils balance their budgets, but of course, removing a bus service can have a real impact on people’s daily lives. Those who have made the decision to live in rural areas, based on previously good public transport links, may find they can no longer get to work or their kids to school; disabled, elderly or otherwise vulnerable people may find that all contact with the extended community has been cut off. Start by locating the bus route in question, and contacting the operator: this is a good first move, because it means you get the facts laid out for you in their response – and even better, because you’re doing it through FixMyTransport, the response is online and available for everyone else to read, too. Note that FixMyTransport’s database contains many discontinued routes, so you can still mount a campaign even if your route no longer exists. There’s a good chance that the reply will say “It’s a budgetary decision from the council, who subsidise this route”. If that happens, click the “ask an expert” button on your FixMyTransport page, and ask for the council’s email address to be added to your campaign. We’ll do that sharpish, and then you can then bring them into the conversation. One message won’t do much on its own, so look at our blog post on how to gather support and take your issue further. This sort of problem is particularly suitable for local press coverage and for getting your local councillors involved – we explain how to do both in that post. The Campaign for Better Transport is a national pressure group which fights for improved public transport. They’ve been running a co-ordinated ‘Save Our Buses’ campaign across the country ever since the cuts started to take effect. On their site, you’ll find an informative campaigners’ guide [PDF], and advice about when cutting a bus service is actually against the law. You can also add your discontinued bus route to their crowd-sourced map. Because the CBT is running a nationwide campaign, they can get real traction behind the political issues driving the slashes in bus provision. They also have links to local groups, and can give advice too. There’s strength in numbers – and if you’d like people to join your campaign, consider joining other ones yourself. People up and down the country are affected by the same issues, and if you share tips and offer support, you can ensure that you’re all more likely to succeed. Good luck with your campaign. We’d love to hear your success stories (and we’ll also listen if you have no success). Posted 14th March 2013 by Myfanwy in News, Problems on trains. This train is formed of… six carriages. We would like to remind passengers that a no-smoking policy is in force on this train. Please ensure that you have taken all your belongings with you when you exit the train. Transport Minister Norman Baker has spoken against frequent announcements on train journeys. Well-known transport commentator Christian Wolmar also finds them intolerable. I can sympathise – in my commuting days, I got quite fed up with the robotic voice repeating the same announcements at every single one of the many station stops on my daily route. 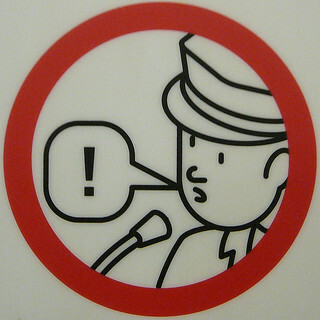 Clearly, announcements play an important role for those with impaired vision – but need there be quite so many of them? In the comments on the BBC report of the story, contributors point out that many are redundant – like ‘this is a no-smoking train’, when smoking is banned on all trains these days. Or ‘thank you for choosing to travel with [this train company]’, when there’s only one operator in the district. FixMyTransport users get exercised about train announcements, too – not to mention on buses, the Tube and on station platforms. Some are for them; many are against. Here’s a small selection. On the Jubilee line: “Loud, irritating, patronising, tedious, whinging, stupid, pointless, endlessly repeated announcements”. We have several complaints about Scotrail’s announcements, including this one: “When this is your life 5 days a week, 49 weeks a year it makes for an unpleasant, stressful and depressing commute”. On London Midland’s Birmingham to Lichfield route: “The problem mainly exists at night when it is hard to see station signs due to the bright lighting on the train”. Given that routine announcements may be a necessity for some and an annoyance to others, I’d like to suggest an opt-in method to hear them, like plug-in aeroplane headphones. No need to thank me, train operators of Britain – my real reward will come when we can all travel in peace. Posted 8th March 2013 by Myfanwy in Fun, Problems with buses. ‘When we tried to get on with two small whippets he refused us entry’. 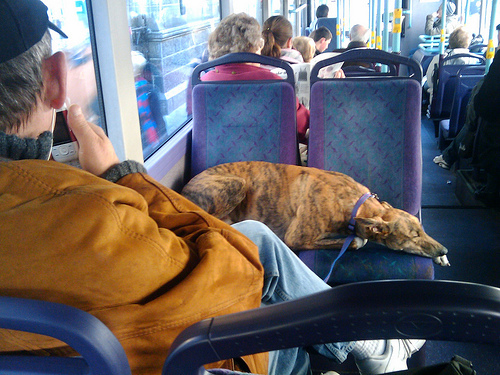 We’re sure dogs can be a pain for bus drivers – but to be quite honest, they haven’t seen the half of it. Just for fun, we took a quick look through Flickr’s Creative Commons, where, we have to say, dogs are the thin end of the wedge. 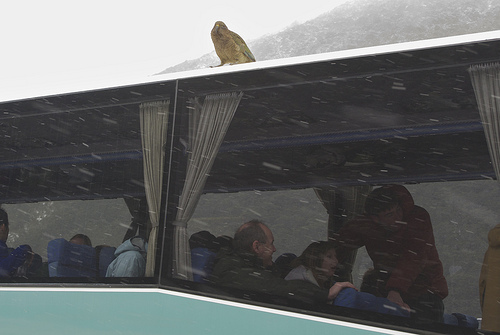 We’d love to see how the transport providers of the UK would cope with these passengers… and we await our first ‘duck on the bus’ report with anticipation. 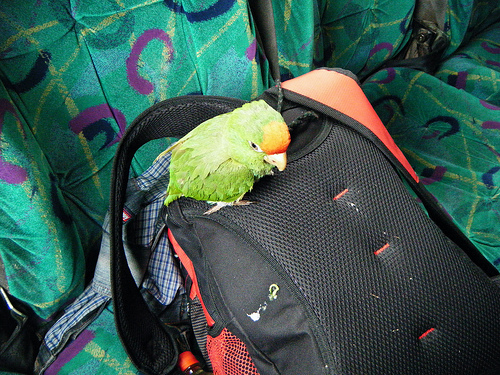 Unusual passenger on a bus in Portland, Oregon. He looks happy enough… although it is hard to tell if it’s actually a stuffed duck. 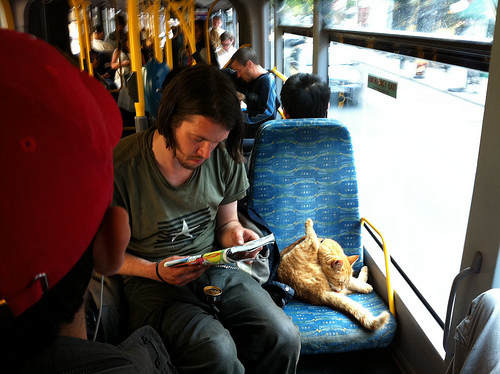 This fellow is apparently Bob, the same cat who achieved some notoriety by riding the Tube. And here he is on the bus. Doing something that would definitely get a human passenger thrown off. Sheep on the roof? Can’t see it on the number 37 bus to Clapham, but in some parts of the world it’s absolutely standard. You know what? 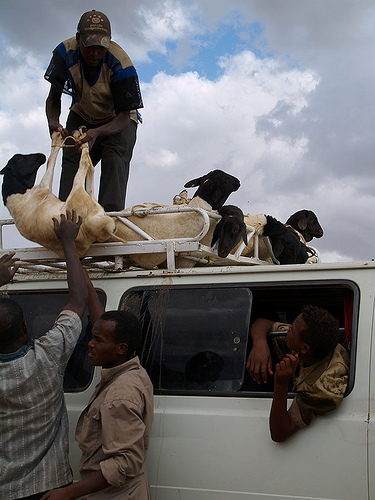 Dogs seem pretty innocuous when compared to a camel trying to board the bus. Maybe this is an image to print out, carry in your wallet, and show to the driver next time they try to stop Rover from boarding. *As you can see from the operators’ replies to these complaints, the regulations about the carriage of animals vary from company to company. Dogs will generally not be carried if they are dirty, threatening or annoying to other passengers, or roaming free – but these are all down to the driver’s discretion. TfL’s guidelines, for example, are here. Rather magnificently, they include the line ‘dogs must be carried on the escalator’, the basis of one of this country’s corniest jokes. 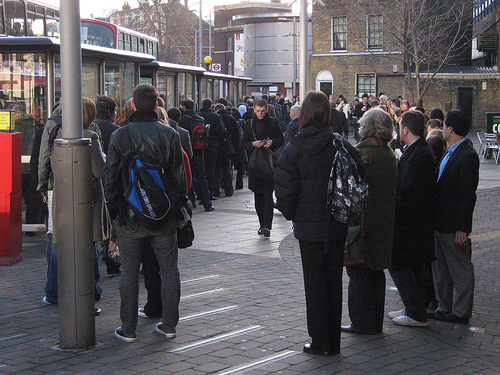 Posted 13th January 2013 by peterdixon in Advice, Delays, Problems with buses. Every day on FixMyTransport, we see a number of very frustrated passengers complaining that their buses are always late. It is annoying to be affected by a repeated failure of a service, we know. But some of these passengers don’t provide enough information to enable the operator to investigate the causes. Some of the largest operators can have fleets of up to 800 buses operating on a network around a major city and tracking these with very little information can be virtually impossible. With the following details, the operator can start to investigate the issues affecting your bus service. They can look at the buses that were in the area and identify the cause. Some are even prepared to offer a refund if the delay was their fault. Including this information will help you get results. But don’t just use FixMyTransport once! If you keep reporting any late running you experience, you can help the operator develop a better picture of delays on the bus routes you use. They are more likely to keep an eye on a situation if they know that someone else is watching it too. Your information may help the operators understand how best to develop their services to meet the passengers’ needs. They can understand if there’s a need for additional buses or a change of route. Or perhaps they will gain the ear of the local council, to ask them improve the transport infrastructure where frequent delays occur. Your communications can even help the operator create a business case for investment to its head office in new buses, more staff, new publicity and even new routes. What may initially seem to be time consuming and pernickety complaints, can very quickly turn into effective lobbying. The squeaky wheel gets the oil, to use an not entirely inappropriate metaphor. Some people have told me that they would expect staff to report these issues or someone in management to be reviewing the services but it is the voice of the customer that can have the most impact on a business when implementing a change. So, in short, if you want to start reporting delays and issues to your transport operators and local transport authorities, get on board at FixMyTransport. Your complaints really can have an effect, if you know what to include. 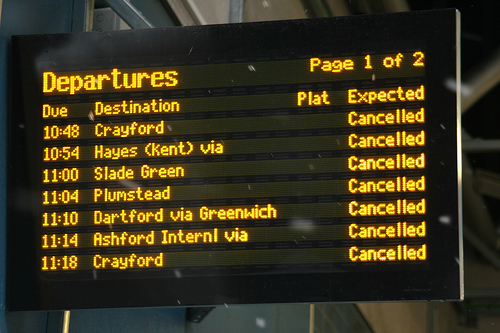 Posted 9th January 2013 by markjones in Advice, Delays, Problems with buses. We’ve covered in detail about how to prepare for public transport disruption, as well as the highs and lows of train heating. Today, I’m going to give some tips on how to complain about bus delays. Traffic: the UK suffers from very bad traffic congestion in its city and town centres – and it varies minute by minute, day by day. So, a bus journey that’s trouble-free for most of the day may have particular issues around the rush hours. Weather: In extreme conditions, buses are forced to turn around, not run at all, or divert from their normal route. This can be at short notice. Extreme weather particularly affects routes which include steep hills, or coastal roads. Roadworks: Typically buses will only divert their routes if the work is scheduled over several days – otherwise, people who don’t see the notifications complain about buses that never turned up. Many different factors affect buses. You may know of notorious bottlenecks in your own area, or regular events such as football matches that mean the buses are held up. Ask the driver what he knows (when he finally does appear). He may tell you the reason right away – but there’s no guarantee that he’ll pass your complaint on, or get anything done about it. Report it on FixMyTransport – of course; that’s what we’re here for, and you may find that other affected passengers also comment on your page. Use Facebook and Twitter to contact the head office. This often gets a quick response, and, as is the case with FixMyTransport, operators are often keen to put things right in public. Once you know the reason for the delays, you might find you’re quite satisfied. 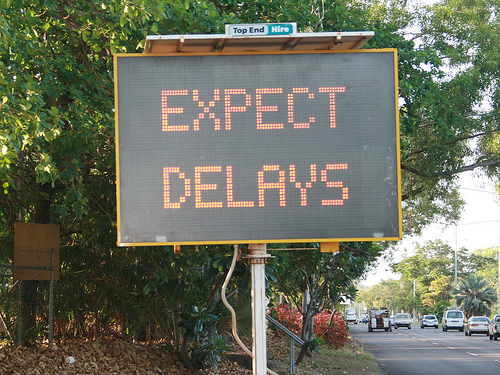 But what if the delay is an ongoing problem, perhaps simply caused by buses taking too long between points – in other words, the timetable is inadequate? The best approach is to gather evidence that a change needs to take place. You can do this by taking notes on a regular basis. Keep a diary of the times you travelled on the bus, and write down the actual times versus the printed times. Presented with this evidence, the bus company or council will be able to see if there’s a good case for changing the times. I’d recommend doing this over a period of a month at different times. You can write them in your diary, or use an Excel workbook – and of course, we recommend updating your FixMyTransport page regularly, so that everyone else who is affected can keep track and add their own comments and ideas. Facts speak volumes when it comes to bus delays, so the more data you can gather, the better – and you may well get a good result. If you have taken the steps described above, and still find that your bus is delayed, it is time to take your problem further. It’s also time to look at our blog post on how to escalate your complaint. 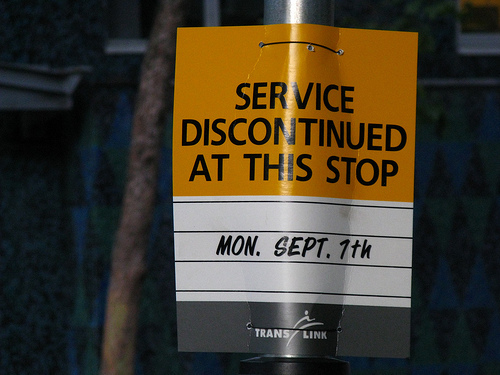 Good luck, and I hope your bus runs on time… eventually. Posted 3rd December 2012 by Myfanwy in Accessibility. Since I started working on FixMyTransport, I’ve had a better understanding of the difficulties faced by disabled passengers across all forms of public transport – which is not a side-effect that I was expecting. I mean, as a frequent public transport passenger, and a reasonably aware person, shouldn’t I have already had a pretty good understanding of this failure in provision? As I travel around my hometown, and further afield across the country, I often see passengers in wheelchairs or mobility scooters (and no doubt I’ve seen, but not noticed, many with hidden disabilities). But those are just the ones who are travelling. Judging by some of the reports we receive on FixMyTransport, many people with disabilities will never try, or have all but given up trying, to travel by public transport. Of course, we don’t see people who aren’t there – and neither do the transport operators, so it’s just possible that neither we, nor the operators, fully understand the extent of the needs of this sector of society. One of the things I really like about FixMyTransport is that it changes the game. It makes a hidden problem visible, by creating a permanent archive of the issues people complain about. It also provides a forum where we can add our support, or debate the best solutions – and put pressure on the operators to implement those solutions. It allows the people who can’t travel, or who can’t face trying, to explain just why that is. Whether it’s buses that won’t take wheelchairs, platforms that can’t be reached without climbing stairs, or environments where people just don’t feel safe, the FixMyTransport reports from passengers with disabilities are doing a service for everyone – they are opening our eyes to the improvements that need to be made in society as a whole, if we are to consider our transport to be genuinely public. There’s no doubt that it’s a tricky business, making public transport accessible. A rail operator recently explained to me that many of the difficulties are to do with the fact that our trains run on a Victorian infrastructure, great engineering that was built to last – but which was also built in a time when the rights of disabled people to travel just weren’t taken into consideration. In these more enlightened times, the law makes sure that every new station built, and every new bus that rolls off the production line, is accessible for all. But it’s a long process, and of course, budgets dictate that less suitable vehicles won’t be retired until they fall apart, and station improvements can only be considered when there’s money in the pot. You might have already asked your local operator for better provision and been given an apologetic, but negative response. In the normal way of things, you might give up at this point. But FixMyTransport gives people a way to come together and campaign at a higher level. You can find other people who feel the same way, or want to support the issue, and you can rally together to contact the bodies that can help you – be that your local councillor, MP, or passenger watchdog. In most cases, operators want to help – but their hands are tied, by budgetary constraints, short franchises, inherited vehicles, rolling stock and real estate. That’s why FixMyTransport aims to give you tools to take your problems higher up, where policy changes can really make a difference. Here are just a few FixMyTransport reports dealing with problems faced by passengers with disabilities. If any of those issues has given you food for thought, why not click the ‘support’ button (which will put your name to the passenger’s campaign), add to the debate, and maybe even suggest a solution? 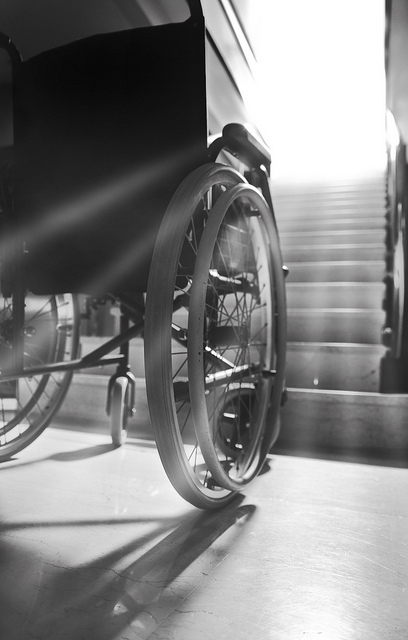 Today, December 3rd is the International Day of Persons with Disabilities, a United Nations initiative. This year the theme is “removing barriers to create an inclusive and accessible society for all”. Posted 30th November 2012 by Myfanwy in News, Problems with bus stops. 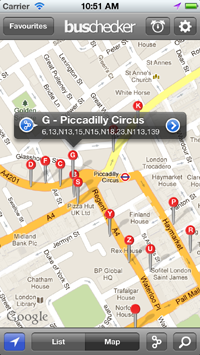 UK Bus Checker is a national travel app which provides bus arrival information on your mobile. Clearly, we have a lot in common, so when they got in touch to see if there was a way we could work together, we were all ears. The Bus Checker app works just like the information displays you can find at some bus stops, but with the advantage that you can check arrival times from anywhere – at work, in bed… or indeed while standing at bus stops that haven’t got displays. 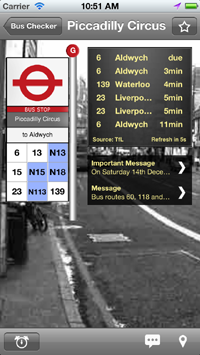 You can also use UK Bus Checker to report problems with bus stops. Sound familiar? Well, that’s where FixMyTransport came in. After a bit of tinkering on both our sides, iPhone users can now report bus stop issues from UK Buschecker, and those which concern damage to the bus stop will be routed via FixMyTransport. 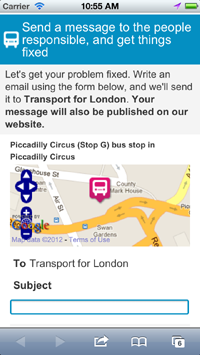 UK Bus Checker hope to roll out this feature to Android and Windows Phone early next year, too. We’re really delighted to have opened up this new channel. FixMyTransport users have seen many successes with bus stop issues getting fixed, and it will be great to offer our platform to the users of UK Bus Checker. 3. There’s the chance to report any problems with the bus stop. 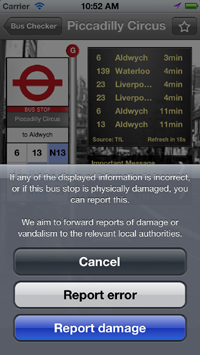 Select whether you want to report an information error, or a problem with the actual bus stop. 4. Reports of damage are routed to FixMyTransport, where, as always, they are sent to the body responsible for bus stops, and at the same time published on our site for comments and support. As for the information error reports, UK Bus Checker monitor them to identify significant or persistent problems, which they’ll then report on directly to TfL and Traveline.